Your first task is to decide what new menus you want to use and what you want to show on your page. All Pages on the SAME LEVEL (this is a shortcut feature I added. A good example why I added it is for a section of pages just like the ones I'm working on now with this tutorial. Let's say you want all of your tutorial pages to have the same menu layout. Instead of having to go to each of those pages individually, you can set them all at the same time with this option. The "SAME LEVEL" means that all of these pages have the same sub page setting. In a shopping catalog, you may have a main page called Shirts, and a bunch of sub pages of different kinds of shirts, such as blouses, short sleeve, etc. You can set all of your different shirt pages at the same time with this option. The picture on the left shows the new menu selection screen that is lower down on the same page (you get to it by clicking he "Menu/Header" button). You will see a number of new choices for pull down menus that appear at the TOP of your screen and LEFT SIDE menus. When you make a selection, you will see a small preview of the menu style appear. Note that the older "dynamic pull down" style is no longer compatible with newer browsers, so you won't see it on the list. If for some reason, you want to go back to the old style, use the "OLD BUTTONS" button you will see on the main yellow control panel screen. This will put things back the old way and turn off the new menu for the particular page you are working on. Next to the TOP pull down menu choices, you can select either "Center Cropped Width" or "All the Way Across". This has a major impact on the look of your page. Center Cropped Width is what I am using on this SiteRightNow page. The width of the menu will match your main page's width. The "All the Way Across" option will extend the menu so that it uses the entire width of your screen. See the "Beware of Too Many Top Level Pages" tips below for more info that may help you make your Crop or Not To Crop decision. Those of you that use long page names, you may want to consider shortening them. Long page names may have an issue fitting onto your pull down menu choice. Shorter names will work much better. Some styles use a smaller font, which will work better for longer names. The "thin" and "sleek" styles are two that have smaller fonts. Use less TOP LEVEL pages. Change the sub page setting on some of your pages to make them sup pages instead of TOP LEVEL pages. Only the TOP LEVEL pages show across the main top menu bar. Change to "All the Way Across" instead of Cropped. The pages may fit, since the menu bar will extend the full width of the screen. The "push over" menu lets you tell the system to start your menu choices further over from the left edge. This choice comes in handy in combination with the "all the way across" choice. You can start your first menu further over and move it away from the left edge of the screen. You can choose between 0 and 300 pixels. Here's another option I decided to add later. I originally put in defaults to keep things simple, but I found that in some cases I wanted more control. 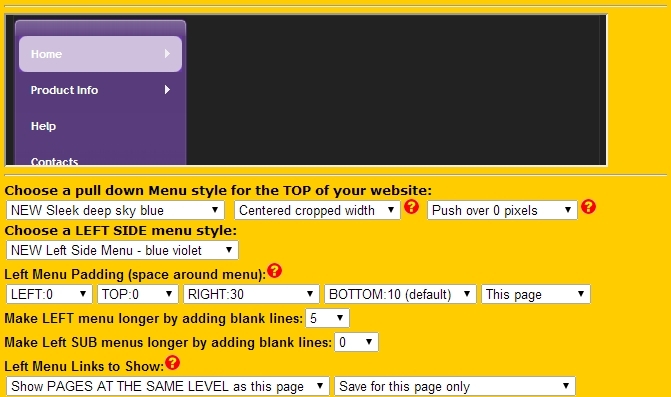 With the padding option, you can move your text and graphics farther away from your menu. I found I needed this setting when I used bulleted lists like I'm using on this page. Normal text had plenty of space around the menu, but the bullets would rub right up against the menu, and I didn't like the way that looked. So I added more control and I was able to change the RIGHT padding setting to 30 pixels, which gave it enough room. You have flexibility of changing one page (this page) where you may have a special situation, or you can save it on a group of pages (This LEVEL) or you can save on all of your pages (All Pages). As I was working on the new system, I thought it could be cool to make the left side menu longer. Normally it will just be long enough to fit the number of selections in your menu, which might be fine in many cases. But I wanted the menu to take up more room on the page for a better look. I liked adding between 5 and 10 lines in my designs. Give it a try and see what looks good to you! You can also change how long the sub menus appear. You can add some height to them by changing the blank lines choice on this screen. ENTIRE SITE: This one is easy. It just shows you everything! SUB PAGES: So, this one will show you ever sub page of the page you are on. Why would you use this? I like using the Shirts page example. Let's say you are working on your main Shirts page and you have sub pages for each type of shirt, such as short sleeve and long sleeve. Choosing Sub Pages on the main shirts page will fill your menu will all the different types of shirts. Very handy for catalog sites or a training section like I'm working on now. SAME LEVEL: So this is one of those features I realized I needed later on after working with the new system! So I apologize for adding even more choices, but this one comes in handy! Let's say you get to your short sleeve page. I wanted all of the other shirt pages to still show in my menu so I could look at the other types of shirts easily. So what this does is show all pages at the same "level" as the current page. You can save time by choosing to save your changes to SAME LEVEL pages. That way all the pages in the section will have the same menu without having to go to each one and save it. If that was still confusing, I can hear someone saying, "I'll just try it"... And I encourage you to try out the different choices and you will see what it does on the menu. It will make more sense after trying the different options.